Throughout the class we have learned about many different cultures and early civilizations. In essentially every one there was a period when a strong ruler came into power and created an empire, or at least stabilized the culture for an extended period under their rule. Specifically I will analyze the similarities and differences between the Greek empire that rose and fell under the rule of Alexander the Great, and the Roman Empire that emerged under the rule of Augustus Caesar. The Romans most definitely learned and adopted many traditions, styles and culture from the Greeks, but always changing them to give it a Roman twist. The building of an empire is no different. Augustus had to have been thinking of Alexander and how his empire fell after his death, so his Roman twist was building an empire that would last past his death. A few of the works that will be examined are: the Portrait of Alexander the Great, Portrait Bust of Cato the Elder and the Augustus Primaporta. Everything considered Alexander the Great’s success can credited in part to his father for laying the foundation needed with numerous innovations and advances in military, then the young ambitious ruler set out to conquer with all his resources and never looked back. Similarly Augustus owes partial credit to Julius Caesar for doing him the tremendous favor of adopting him and naming him heir; Augustus took advantage of the opportunity, but was genius in the way he maneuvered to gain complete control of Roman and began a lasting empire. The influence of art from Alexander the Great can be seen in the art of both the Roman Republic and the Roman Empire. Overall the Roman Empire under Augustus has many similarities with Greece under Alexander the Great ranging from origins of the respective empires to the art depicting the rulers. Encyclopædia Britannica Online, s. v. “Augustus”, accessed April 20, 2015, http://www.britannica.com/EBchecked/topic/43047/Augustus. Conquests of Alexander the Great”. In Heilbrunn Timeline of Art History. History.com Staff, “Augustus” 2009. A&E Networks, 2009. 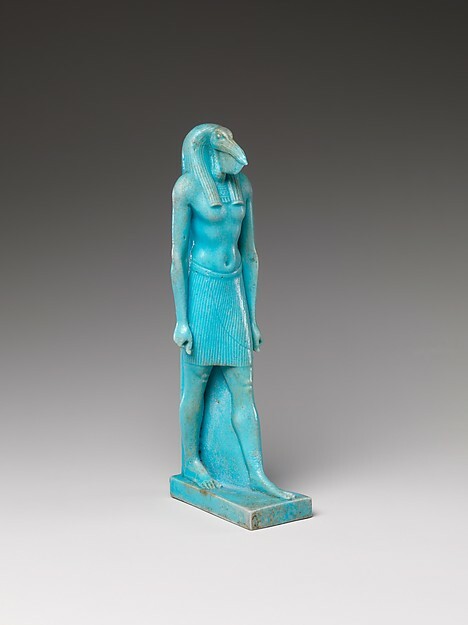 Thoth was a popular god in the Ancient Egyptian pantheon. He was commonly known as the god of learning, writing, the languages, essentially the god of knowledge. Thoth was also the god of the moon. He was considered to be the inventor writing and the creator of the languages; Thoth was also known as the scribe and the interpreter because he was an adviser to the other gods. In some instances he was a representative of the sun god, Re. The sacred animals that were used symbolically of Thoth include the ibis, which is a small bird with a curved beak, and the baboon. The most common depiction of Thoth is a man with the head of an ibis, sometimes holding a scribal palette and reed pen. The depictions where Thoth is holding the scribal palette and reed pen are symbolic of his being and adviser to the other gods; some of his other similar titles included mediator and peacemaker. Other depictions such as the baboon or just the ibis bird are also symbolic of Thoth. Millions of mummified remains of ibis and baboons were found near the city of Hermopolis, which was the center of the cult that worshiped Thoth. (Encyclopedia Britannica) It is located in Upper Egypt, south of Cairo, on the Nile River. Hermopolis was known as Khmunu in Ancient Egypt. In every depiction one thing is common, Thoth wears a lunar crescent on his head because he is the god of the moon. (Dixon, pantheon.org) However, the crescent moon was also believed to be similar to the curved beak of the ibis, so it also has connections there. Another connection with the moon is the baboon. Baboons are nocturnal animals, so the crescent moon again seems relevant. In the myth of Osiris, Thoth protects Isis during her pregnancy; he then goes on to heal her son’s (Horus) eye that had been wounded by Seth, the adversary of Osiris. In the legend Thoth uses intellect and magic to aid Horus in defeating Seth. Thoth also was in charge of weighing the hearts of the deceased at their judgment. After he weighed their hearts Thoth would report back to Osiris with his decision and what kind of afterlife the person deserved. The Greeks identified Thoth as Hermes, who was the messenger god. They said he was “Thoth, the thrice great.” The image chosen is of a small five and a half inch statue of Thoth. He is in the common form as a man with an ibis head, however he does not have a scribe and reed, and he depicted is walking hence the name, Striding Thoth. Some countries believe that artifacts and major discoveries that originated in their own country belong to them regardless of who discovered it. These countries claim that the artifacts belong to them even though the artifacts are from ancient times and were not produced by the cultures within the countries today. Many of these countries want these artifacts to return to their original region as opposed to sitting in a museum in London or Paris. These museums, such as The British Museum and The Louvre, have a different opinion. Museums like these are called encyclopedic museums, and they hold many artifacts that came from all over the world, including Egypt. By having so many artifacts from so many different cultures in one place it makes it interesting to see how the cultures were similar, different, and how trading influenced the ancient world. As mentioned earlier, the countries want the artifacts back because they believe they own them because it was produced in their region and is a part of their national history. These countries are essentially ignoring the fact that cultures are in a constant state of change, mainly due to trading and cultural exchange. Also, they are contradicting the idea behind encyclopedic museums by demanding they send back all of the artifacts. Encyclopedic museums are meant to show artifacts and objects from many cultures around the world in one place to ignite curiosity about the world, the way cultures connected, and the people who were involved. I believe that the museums should remain the protectors of the disputed artifacts because they have the means to maintain these artifacts, and above all keep them safe. The issue of ownership in regards to antiquity is clear to me, it belongs to the people of the world, not just a specific country. These encyclopedic museums, such as The British Museum and The Louvre, are perfect examples of this idea. Anyone can go into The British Museum and see some of the most amazing artifacts from antiquity for free. To me that is simply amazing, when I was there last July I was at a loss for words due to the overwhelming amount of artifacts from all over the world that were suddenly before my eyes. “By presenting the artifacts of one time and one culture next to those of other times and culture, encyclopedic museums encourage curiosity about the world and its many peoples.” (Cuno, 120). The previous statement hit the nail on the head because that’s essentially the sensation I had while inside The British Museum, and again when I was in The Louvre only 2 days later. Some countries would have their artifacts sent back for the sake of nationalism and sectarianism, which have nothing to do with antiquities but they would use them to persuade such ideals. These countries are basically claiming that the culture only existed there, and there it should stay. “Instead, they should express the guiding principles of the world’s great museums: pluralism, diversity, and the idea that culture shouldn’t stop at borders – and nor, for that matter, should the cosmopolitan ideals represented by encyclopedic museums.” (Cuno, 120). The exchanging of artifacts between museums is one idea I can get behind. Instead of trying to take back artifacts countries should be working with museums to get artifacts not only from their past cultures but from all over the world. If more and more museums did this then more and more people could be exposed to multiple cultures from different regions of the world. Not everyone has the means to travel to museums like The Louvre, so if artifact exchanging became a common practice then it could spur a new interest in cultures people might not have even knew existed. Again this goes back to the idea of a cosmopolitan world, and that culture doesn’t have borders. Dispute over ownership of antiquity artifacts is not something that is going to go away over night. Countries will keep pushing to have certain artifacts returned, but the museums will do their duty and stand their ground. The artifacts from antiquity cannot be replaced, so maintaining their condition and keeping them safe is a major concern which the museums handle magnificently in addition to allowing the world to experience a jump back in time when you walk through the doors.